Facebook is the fastest growing social networking website. A presense of your website in face book give a good impression to the viewers. If you have lots of followers in facebook, then that shows your site popularity. Facebook provides "Like Box" service, so that users can link their website to facebook and promote the website contents, Using "Share" and "Like" options contents can be shared across various communities and friend groups in facebook. Once a user "Likes" your website post, immediately the people in the friend groups of th eperson who "liked" your post will get an intimation. So there is a chance that several people may look into the "Liked" site and it may driver visitors to your website. It is very easy to install the facebook like button on your wordpress theme. The above codes for blogger and wordpress are in general format, you can customize it according to your needs. You can change the layout , height , width etc.. 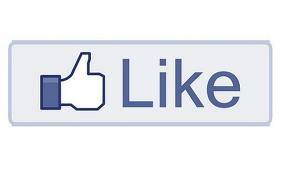 If you want to show only the Like count in the button then change layout=standard to layout=button_count. if you want to hide the faces of the people who like your post then change show-faces=true to show-faces=False. You can also change the color scheme to dark by changing colorscheme=light to colorscheme=dark and other small changes regarding the height and width of the button. How to create facebook fans page? How to create Facebook Like Box Widget?